This is a long feature, but worth a read. 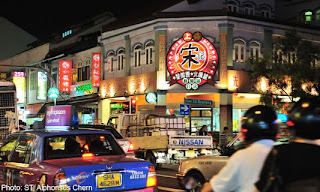 Welcome to Singapore's true Chinatown - Geylang! Singapore's 'official' red-light district is transforming into a social enclave for Chinese foreign, and migrant workers. As you read on, you might notice that the Chinatown in Chinese is 'Tang Ren Jie' literally, Street of the People of the Tang. Now why not Han Ren Jie (i.e. Street of the Han People)? The Chinese are often known as the Han (ethnicity), even the spoken language is known as Han, so why 'Tang Ren Jie', where 'Tang' refers to the 'Tang Dynasty'? Now this is an ancedote so I'm not entirely sure. Apparently the Teochew diaspora was responsible for much of the establishment of Chinatowns around the world. Out of the 40-over million Chinese overseas, more than half are Teochew. Now this is way more Teochews than there are on the mainland. And I'm Teochew too. Known to be rather resilient entrepreneurs (think Thaksin and Lee Ka Shing), they've become some of the richest overseas-born Chinese there are today. Now, the Teochews, geographically and socially never quite associated themselves with the Han (people and dynasty), but more with the culture and ways of the sophisticated Tang Dynasty - and there you have it. Tang Ren Jie. China nationals are flocking to Geylang, drawn by low rents and cheap food. Ask Hebei native Albert Li where the real tang ren jie, or Chinatown, is in Singapore, and he will tell you confidently that it is in Geylang. “Among the Chinese nationals here, we have privately discussed this many times,” he said in Mandarin. “Geylang is more like a tang ren jie than Chinatown. There must be more Chinese nationals living and working here than in Chinatown,” said the 25-year-old. Mr Li, who has been in Singapore for almost two years, mans a provision shop on Geylang Road which sells goods from China. Indeed, his sentiments are shared by most of the China nationals whom The Sunday Times met in the neighbourhood known for its red-light allures and food. No official numbers are available but anecdotal evidence suggests that a growing number of China nationals – namely the working class, students and entrepreneurs – are flocking to the precinct. Singaporeans certainly have noticed their presence. In a letter to The Straits Times Forum two months ago, a reader observed how Geylang has evolved from a racially mixed, multilingual area into an enclave for new residents from China, with a growing prevalence of Chinese-only shop signs. When The Sunday Times visited the neighbourhood last week, many such signs were seen, advertising Chinese products and services like hairdressing and Internet usage. Mom-and-pop eateries serving authentic Chinese cuisine dotted the shophouses. Their waitresses, almost all China nationals, greeted passers-by in various Chinese accents. Drive by in the evenings, and you spot groups of Chinese workers sitting along the busy streets to unwind. Why is Geylang such a magnet? Dr Leong Chan Hoong, a research fellow at the Institute of Policy Studies, said that historically, immigrants from developing countries tend to congregate in the less fanciful or desirable town centres because of lower rent and cheaper food. This was true of Chinatown in Singapore, and elsewhere, like the Newtown suburb in Wellington, New Zealand, and the Fortitude Valley in Brisbane, Australia, he said. “Geylang is a food haven and a district populated with places of worship, clan associations and other traditional enterprises. New arrivals could have been drawn to Geylang because of these characteristics,” he said. Indeed, China nationals who live and work there said they chose Geylang for its lower rents, array of Chinese food and accessibility. Mr Liu Yang, 28, who lived in a dormitory for foreign workers for eight months, said the rent for a bed space in Geylang is between $150 and $180 a month, way below that elsewhere. “I’ve a friend who works in Chinatown. He tried to find a place to stay in Outram and was quoted $280 for a bed space,” said Mr Liu who works at a beancurd shop in Geylang. He lives in Whampoa now. Ms He Wen Wen, 24, chose Geylang as it is near her school in Aljunied, where she studies accounting and finance. The Henan native lived in an HDB flat in Sengkang before moving to a condo in Geylang with seven friends – all students from China – five years ago. Dr Leong said the nooks and corners in the neighbourhood also favour small-time businessmen who can nurture their trades at a lower cost. Indeed, businesses like Internet cafes and eateries targeting the Chinese have mushroomed. Earlier reports estimated that there are about 200 food outlets opened by China nationals. On weekends especially, scores of their countrymen living elsewhere flock to the area for a touch of home. Singaporean Kelvin Ho, 35, who runs two supermarkets in the neighbourhood, has benefited from their presence. Some 70 per cent of his customers are China nationals. “I’ve been doing business here for about 10 years and it’s obvious to me the number of China nationals is growing,” said the businessman who stocks items like vegetables and beauty products. Dr Leong said a social enclave like the one developing in Geylang is harmless and is a natural coping mechanism for new immigrants. Sociologist Tan Ern Ser from the National University of Singapore agrees, noting that social enclaves serve the needs of new immigrants and help them settle in faster. But if it becomes a segregated community with different habits and values, it could lead to prejudice, discrimination and tensions, he said. Already, some Singaporeans whom The Sunday Times spoke to are complaining that the China nationals tend to talk loudly and some have undesirable social habits. Ms Linda Ong, 40, who runs an electrical goods store on Geylang Road, said they sometimes discard empty bottles or food outside her shop. However, Geylang Serai citizens’ consultative committee chairman Eric Wong said he has not received any feedback specifically about China nationals, although residents do complain about the crowds and noise in the area. He does not think Geylang is evolving into a Chinatown. “There is a good mix of foreigners and locals here,” he said. Whether the area will continue to draw the China nationals remains to be seen. Dr Lai Ah Eng, a senior research fellow at the Asia Research Institute, noted those who have moved up socially and economically tend to relocate. Ms He, for one, hopes to move out of Geylang once she finds a job after completing her studies. Good place to work but not to live. For four years, Geylang has been both home and workplace for Shandong native Wu Min. He lives in a condo in Lorong 31 with his wife, also a Shandong native. She is a nurse at the Singapore General Hospital. They met in Singapore four years ago through a friend when Mr Wu was studying for a degree at the Singapore Institute of Materials Management. They registered their marriage here last year and have a four-month-old daughter, who lives with his parents in China. He opened a provision shop here after he found the work at a logistics company, which he had joined after his studies, too stressful and the pay low. The 29-year-old said he chose to do business in Geylang because of its large Chinese population, wide variety of food and convenience of travel. He used to visit restaurants in the area on weekends. Sited between Lorong 11 and 13, his provision shop sells local products and China imports. The minimart, called Ba Fang Guo Huo, has another outlet between Lorong 40 and Lorong 42. The two outlets were set up with $100,000 borrowed from his parents. Every month, he pays about $6,000 in rent for each of his shops, and income is just enough to cover costs now. About 60 per cent of his customers are China nationals. “It’s more like ‘Chinatown’ than the real Chinatown. You see Chinese here every day, not like in Chinatown, where perhaps the Chinese may visit on weekends,” said Mr Wu. Given a choice, however, he said he would not want to live in Geylang. He is considering moving to Tampines, where he lived for about two years as a student. “Geylang is a good place to run a business but it’s not so ideal for a home,” he said, referring to the red-light district. For married couple Dai Xue Yong and Zhang Zhi Ying, Geylang was the perfect location to set up their food business, Orient Garden Restaurant. The one-year-old homestyle eatery, which serves Shanghainese cuisine, sits alongside several other Chinese restaurants. “We know that Geylang is a food haven. We thought we could offer another variety of Chinese cuisine,” said Ms Zhang, 40. Indeed, on week nights and weekends, their eatery is packed with China nationals who go there for a taste of home. Singaporeans and tourists are among the patrons as well. Ms Zhang said she and her 43-year-old husband had considered setting up shop in Chinatown, but a scouting trip to Geylang last year led them to do so in Lorong 39 instead. They have been in Singapore for a year now and used to run a trading company in Shanghai. The couple hired two chefs and two waitresses from China. They will consider opening a branch when business picks up. They are now making small profits after paying the monthly rent of about $8,250, Ms Zhang said. The couple live in the upstairs unit of the shophouse that is home to their restaurant. They like the location because they can get both local and China products easily. “If I feel like eating prata, there’s a stall just down the street. If I want to eat Chinese food like dianxin, it’s also easily available here,” she said.